If you notice flakes of dandruff on your kitty's fur, it's helpful to understand the reasons for dry skin in cats. The flakes can sometimes be a symptom of a disease, but they are often related to nutritional issues or over-bathing. Find out what you can do to help. Though dry skin may seem like a simple issue to treat, it is best to first consult a veterinarian who may be able to identify any trigger factors. Malnutrition is a common cause of dry skin problems in cats. When felines don't get their proteins, vitamins, and minerals in the right proportions, their skin and coats are the first to suffer. An unbalanced diet can lead to a deficiency in essential fatty acids, especially the Omega-3 fatty acids. These acids contribute to overall cellular health, and they are part of the building blocks that make up your cat's fur. Although many cats never receive a water bath in their entire lives, some cats do need to be bathed. This is especially so for long haired cats and cats with recurring flea infestations. Although shampooing is good and necessary in some situations, it can also strip the natural oils from your cat's coat. When baths are spaced together too closely, the skin doesn't have time to recover its ideal balance, and soon flaking and fur loss become evident. 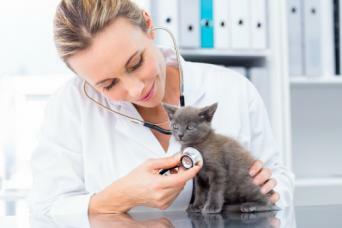 Certain diseases can also throw your cat's system out of balance. Low thyroid problems cause hormonal imbalances that can affect every aspect of your cat's health, including his skin health. Improperly functioning kidneys allow a variety of toxins to build up in your cat's bloodstream. The liver tries to filter out as many additional toxins as it can, but some are left to run down your cat's health. You might find it difficult to believe that heart disease can affect your cat's skin, but poor circulation reduces the amount of life-giving oxygen delivered to your pet's scalp. The result is increased cellular die-off and flaking. 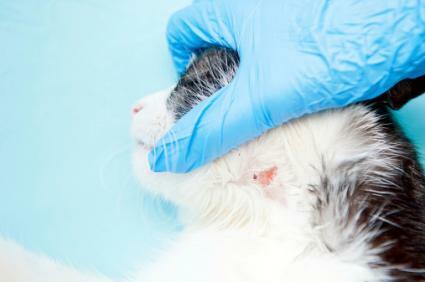 When your cat develops an allergy to food, environmental pollutants, inhalants and parasites like fleas, the results of those allergies are often expressed in the skin. 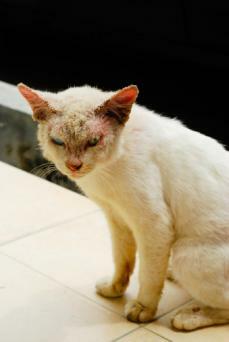 Itching drives your cat to scratch incessantly, and this damages the skin. In turn, you try to provide relief through anti-itch shampoos and sprays, but as mentioned above, these products tend to rob the skin of its vital oils. Felines that suffer from chronic skin problems, such as seborrhea and psoriasis, also require frequent bathing. Although this helps loosen scaling and reduce inflammation, you can still wind up with a dried out cat. So, how do you alleviate or prevent dry cat skin problems? You use a three-pronged approach. Do a little research on your current brand of cat food and compare it other high quality brands. How fresh is it? Does it contain enough Omega-3 fatty acid? If necessary, switch your cat to a more nutritionally complete brand of cat food. Supplement your cat's current diet by adding 1/8 of a teaspoon of very fresh fish oil to her food every other day. Offer your cat a little fresh salmon every week. It's rich in nutrients that support healthy skin and coat. 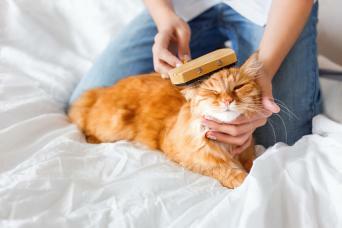 Good grooming habits can improve the condition of your cat's skin and fur. Provide daily brushing. This increases the circulation in your pet's skin and helps distribute natural oils across the entire scalp and coat. It also removes dead fur so it doesn't tangle up with the new coat coming in. When this happens your cat's skin suffocates under the mats. Use quality shampoo. If you must shampoo, only use shampoos that include moisturizers, and be sure to use a cream rinse to help lock in your cat's own natural oils. Mist your cat. Topically, you can provide immediate relief for your cat's dry skin by misting her with a light concentration of bath oil mixed with water. Avon's Skin So Soft is a good product to use for this kind of treatment. Mix about one teaspoon of oil to eight ounces of water and lightly mist her entire coat, but take care not to get it in her eyes. Next, brush through the coat to distribute the oil right down to the scalp. This is a very good remedy when used in conjunction with proper nutrition. Taking your cat for a bi-annual check-up allows your vet to spot illnesses and infestations before they have a chance to wreak havoc on your feline's health. Think of it the same way you regard regular maintenance for your car. When you check the parts for wear and tear, the engine continues to run smoothly. The same can be said for your cat's body. However, the American Society for the Prevention of Cruelty to Animals also recommends that you consult a veterinarian at the first sign of any abnormality in your cat's skin. Early diagnosis is frequently attributed to a faster recovery, should your cat be harboring a more serious underlying disorder.